Before those goods and services are delivered to us, the steel itself needs to be produced. Some industrial applications within the steelmaking process in a steel plant are coke pusher cars, coke guide cars, quenching cars and coal charging cars. These applications play a critical part in the steelmaking process by creating a means of transportation for the raw materials to get to where they need to go. As you may know, when steelmaking processes stop due to failed electrical cable in one of those cars, it can lead to costly downtime. CHALLENGE: Our customer, the electrical planner at a steel coke plant, was experiencing expensive downtime due to cable failure in an extreme temperature, high flex & abrasive application. Specifically, it was a coke charge car application. SOLUTION: We suggested a combination of several TPC products (including extreme temperature resistant cable) to significantly reduce their costs, and keep their coke charge car application efficiently up and running in an extreme heat and abrasive environment. 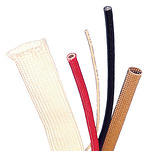 The electrical planner is currently making variable length male/female high temperature extension sets using one of our extreme temperature resistant cables (16/3 Thermo-Trex® 2800) as well as our Field Installable Micros with Pyro Sleeving. We suggested using the Field Installable Micros to standardize the termination and allow the fastest possible repair (if needed). The bottom line is that the customer expects the assemblies to fail, but have plug-and-played their entire charge car to save downtime on a changeout. In this case, it survived 15-20 minutes of extreme temperatures. The assembly survived and allowed them to complete the production cycle without any downtime. The Thermo-Trex® 2800 works very well in extreme temperature applications (like coke charge cars) and can withstand continuous temperatures up to 1000ºF (537ºC) and flash heat up to 3000ºF (1649ºC). However, if any abrasion was anticipated in the charge car application, the customer had used the Thermo-Trex® 2800 with a Stainless Steel Overbraid. Due to the constant flexing of the cable they were developing shorts even with the Stainless Steel Overbraid, so we suggested using Stainless Steel Flex Tubing in place of the Overbraid-which has seemed to alleviate the short issue. TPC provided Extreme Temperature Resistant Cable (Thermo-Trex® 2800), Field Installable Micros, Stainless Steel Tubing and Receptacles to prevent the cable from shorting while in application. The customer is no longer experiencing frequent downtime, and is saving approximately $35,000 per hour. Thermo-Trex® 2800 and other extreme temperature resistant cables can be a solution for any industry with applications in extreme temperature and high flexing environments. In addition to wire and cable, TPC carries accessories like the Stainless Steel Flex Tubing which acts as additional layer of protection from abrasion. Stainless Steel Flex Tubing is recommended for the following industries: food & bev plants, machine shops, CNC shops, utilities, lumber yards, packaging plants and the plastics industry.